One look at this Subway Art, and I had to have it! Lucky for me, it came with instructions. Only, I decided to use canvas because I'm lazy and I didn't want to cut my own wood. Take my advice and cut the wood. The lettering will not stick to the canvas very well, so I spent a lot of time doing touch-ups. Consequently, there are a lot of mistakes that make me a bit nuts. 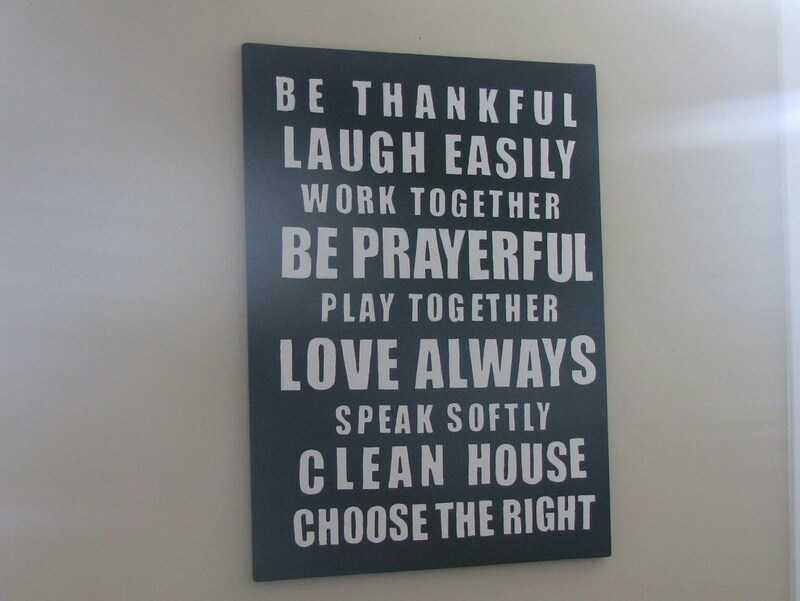 But I still like it because it reminds me of the things I want for my home. My husband laughed at the "clean house." As I said, it's what I want and not what I always have! look at you...once again...in all your crafting glory. That's right. It's what you want, not what you always have. You know, crafting isn't enough. Homeschoolers also have to grind wheat and make their own bread. I love the sign. I especially like that it says 'choose the right'. I have been on the right since my first real paycheck.